The performance of any loudspeaker will be influenced by the acoustics of the space in which they operate. Difficult room acoustics, combined with improper loudspeaker placement, can interfere with achieving the fidelity of which your loudspeakers are capable. Understanding how a room interacts with audio will help you to get the most out of your system. In most live environments, the room is rarely designed to maximize the listening experience. For large-scale tour productions, venues are often sports arenas that have been designed to maximize crowd noise. Smaller music venues are often chosen for location or architectural aesthetics, rather than music reproduction. It’s necessary to recognize and correct what that space does to the sound system in order to optimize the P.A.’s performance in the venue. Size. The size of the room directly impacts how well certain frequencies will be reproduced. This may seem odd until you think about the physical length of audio waves at various frequencies. When a room’s width or length correlates directly to the length of a waveform at a specific frequency, a standing wave can occur where the initial sound and the reflected sound begin to reinforce each other. Let’s say we have a long, narrow room where the distance from one side to the other is 22.6 feet. A 50 Hz wave is also about 22.6 feet long. (To calculate how long an audio wave is, divide the speed of sound—1,130 ft./second—by the frequency. For a 50 Hz wave, 1,130/50 = 22.6 ft.) When a 50 Hz wave bounces off the wall, the reflective wave travels right back along the same path and bounces off the other wall, and the cycle repeats. In a room such as this, 50 Hz reproduces very well—maybe too well. So any audio in that room will have a heavy low end because the low frequencies are being exaggerated by the room acoustics and you’re likely to have for compensate for them, either in your mix or by using a system EQ. Construction. Low-frequency waves can be powerful enough to cause the walls, ceiling, and even the floor, to flex and move. This is called “diaphragmatic action,” and it dissipates energy and strips away the low-end definition. So if your room’s walls and floor are made of solid brick and concrete that don’t vibrate much, the bass response is going to be much more powerful than if you’re in a room where the walls are normal sheet rock construction and the floors are hardwood. Reflectivity. Another way a room interacts with sound waves is through reflectivity. Like most room anomalies, reflections can be good and bad. Consider the effect of a cathedral’s reflections on a choir or a piano. This type of reverberation (reverb) is quite desirable for recording and acoustic listening but not for loudspeakers reproducing audio at normal stage volumes. If a speaker is placed near a reflective surface (such as a brick wall or window), the direct sound coming from the speaker and the reflected sound coming from the wall can arrive at the listener’s ears out of phase with each other, causing cancellation and/or reinforcement. If you are setting up your loudspeakers in a reverberant space, position your speakers so that as much sound as possible is focused on middle of the room and steered away from reflective surfaces. Installing acoustic treatment on the walls will also lessen the impact of reflections at your listening position. Very low frequencies are not directional, so they radiate from the sides and back of the loudspeaker, as well as from the front. 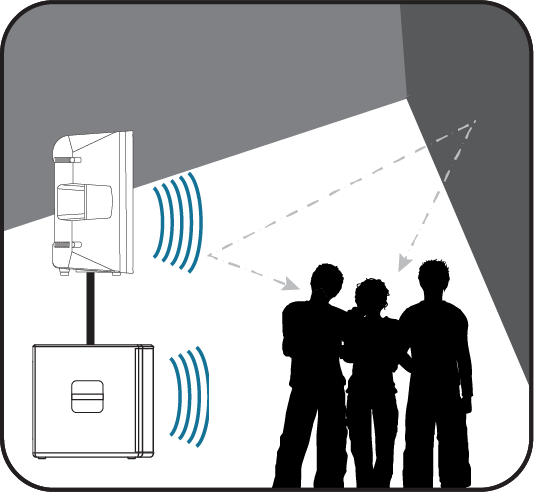 If you place a loudspeaker against a wall, the rear sound propagates back into the room. This can increase the bass frequency output as much as 6 dB if the speaker is placed near one wall (half-space loading), 12 dB if placed near two walls (quarter-space loading), and as much as 18 dB if you put the loudspeaker next to the ceiling or on the floor in a corner (eighth-space loading). To have the most control over your sound, it’s best to start with the flattest response, so you normally should avoid wall and corner placement. On the other hand, if you need some extra bass boost, this technique may be worth a try. It is important to be aware of what’s happening and be prepared to take advantage of it or compensate for it. 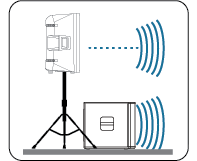 Because a floor monitor placed on the stage is unavoidably subject to half-space loading, PreSonus loudspeakers feature a “Monitor” preset. This preset is specifically designed to compensate for bass buildup while maintaining a tight mid-bass response and a clear midrange. The size and shape of your room and the application for which it will be used determine, to a large extent, how many speakers you will need and where they should be placed. In every situation, keep in mind your loudspeaker’s coverage pattern. Horizontal Coverage. It is important to place loudspeakers so that there is a smooth transition from one loudspeaker’s coverage area to the next loudspeaker’s coverage area. This creates an even response throughout the listening space. Vertical Coverage. 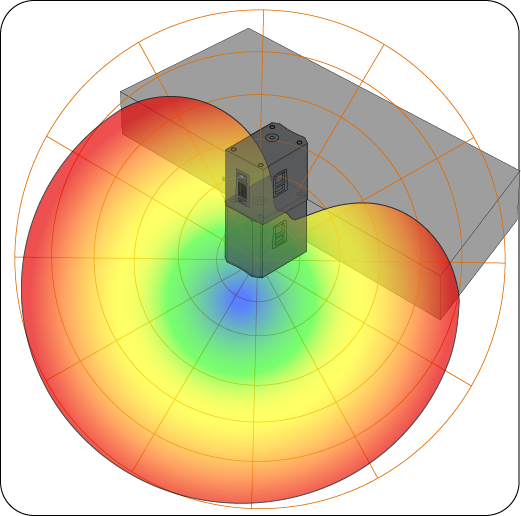 If you are using a ground stack with a pole mount, make sure your vertical coverage matches the listening plane. Suspending speakers will provide even further control. PreSonus loudspeakers feature dual-position pole mounts. Using the downward tilt mount will focus the loudspeaker’s energy onto the audience and avoid destructive reflections. This is ideal for situations where the loudspeaker is mounted atop a tripod stand and placed on a stage, or where the pole-mounted loudspeaker is on the floor and the coverage area is relatively shallow (conference, coffee house, etc.). A Quick Note on Stage Monitoring: When used as a floor monitor, a loudspeaker’s coverage pattern will reverse (that is, horizontal coverage becomes vertical coverage and vice versa). In most cases, this new pattern offers benefits. For example, when laid down as a floor monitor, a PreSonus ULT12 has a 50˚ (H) x 110˚ (V) coverage pattern. As the dispersion narrows to 50˚ in the horizontal, the floor monitor’s energy is focused to a relatively limited area that won’t bleed over into either side, creating listening zones and better clarity. The 110˚ dispersion in the vertical allows the performer the freedom to move forward and back within their zone. For instance, a singer can stand directly on top of their floor monitor to reach out to the audience and hear their mix as well as they can when they back up to the front of the drum kit to jump off the bass drum. Some loudspeakers, such as the PreSonus StudioLive AI- and ULT-series, allow you to rotate the horn so that the dispersion pattern is the same in both vertical and horizontal orientations. In general, this feature should be reserved for horizontal mains use, not for floor monitoring. In most situations, a PA system relies on a main speaker system, positioned at the front of the room, to reproduce audio for the entire performance space. As a result, the level of the system is considerably louder at the front of the room than it is at the mix position. In situations where sound must be reproduced outside of the main system’s optimum range, well-placed delay systems can extend the intelligibility of the front-of-house system. By creating listening zones throughout the room, your front-of-house system only needs to be loud enough to cover the front of the room. As a result, you can lower the mains level, give the front-row listeners’ ears a break, and get better fidelity from your speakers. The goal of distributed sound is for the people in the back row have the same listening experience as the people in the front, but it isn’t as easy as just putting up an extra pair of speakers. Since electricity travels much faster than sound, listeners in the rear of the room will hear the sound coming from the nearest set of speakers before they hear the sound from stage. This dampens the attack and intelligibility of the sound, creating an unpleasant phasing effect. In large venues, this can actually sound like a short echo. To create a delay sound system, you need to delay the signal going to the additional speakers. For example, since sound travels at roughly 1,100 feet per second (with some variation due to temperature, humidity, and elevation), it takes about 55 ms for sound to travel 50 feet. So if you put your delay speakers 50 feet away from the Front-of-House system, you need to delay the signal going to the satellite system by 55 ms.
Once you have positioned and delayed your satellite system, use an SPL meter to match the output of the main and delay systems at the measurement point. For example, if you are standing 30 feet from the left side of the main system and 10 feet from the left side of the delay system, and the output of the main system is 85 dB, then the output of the delay system should also be 85 dB. It should be noted that frequencies in the sub-bass range of a delay system do not require distribution. In fact, a delay system’s highpass filter should be rolled up as high as 300 to 400 Hz to avoid sound going back toward the stage as low frequencies become omnidirectional. There are standalone speaker processors that provide output delays to configure distributed delay systems. Also, some digital mixers, like the PreSonus StudioLive series, offer delay on some or all outputs for precisely this purpose. Inside. Indoors, you are trying to overcome the direct-to-reverberant reflections. Your goal is to find where the direct signal-to-reverberation ratio has reached about 50/50. At this point, the reflections in the room are at an equal level to the direct sound of the P.A., and vocal intelligibility is lost. Outside. Outdoors, you are trying to maintain level as the noise floor of the crowd begins to be at equal level to the P.A. in the intelligibility range. At this point, the main system needs more support in order to deliver the same perceived loudness as you get further from the source. Adding a subwoofer to your sound system allows it to run more efficiently because the low-frequency content is reproduced by the subwoofer instead of the full-range system. This section will guide you through the steps necessary to add a subwoofer so that you get the most out of your investment. Most subwoofers, including those made by PreSonus, provide throughputs to connect satellite full-range systems. However, in a large venue, it’s recommended that you run your subwoofers on an output separate from your main front-of-house full-range loudspeakers. A post-fader aux mix output is ideally suited for this as it provides independent level control over the subwoofer system and greater flexibility over the bass content in your mix, while still following the main mix mutes. Creating an aux mix for your subwoofer system is just like creating an aux mix for a floor monitor only instead of creating a mix for a musician, you will be creating a mix using instruments that provide sub-energy content. Another advantage of using an aux mix is that if, for example, you want the kick drum to punch louder in the subwoofer, you can raise its level in the subwoofer only. 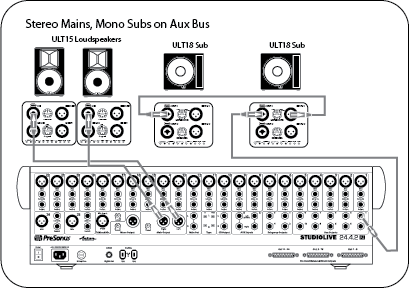 It is also recommended that you run your subwoofer system in mono, even if your full-range system is in stereo. When adding a subwoofer to your full-range system, you will also need a crossover. This external device provides a highpass filter for full-range loudspeakers to remove audio content below a specified frequency, as well as a lowpass filter for subwoofers that removes audio content above a specified frequency. Depending on the system, leaving a frequency content overlap between 60 to 120 Hz in your full-range loudspeakers and subwoofer can introduce destructive cancellation and reinforcement. Using a crossover will eliminate this frequency overlap and help you to create a more seamless transition with your subwoofer. Most external crossovers are fully variable, allowing you to create a smooth transition from your subwoofer system into your full-range system. Many full-range loudspeakers, including PreSonus StudioLive AI-series and ULT-series loudspeakers, help to mitigate this issue by including a 100 Hz highpass filter. Some subwoofers, like the PreSonus ULT18, AIR15s, and AIR18s, are equipped with a variable lowpass filter, allowing you to dial in the best crossover point for your system. In this way, you can set the upper end of your subwoofer at the lowest frequency point that your full-range system can reliably reproduce. PreSonus AIR-series subwoofers make this even easier by providing lowpass filter presets optimized for each AIR-series full-range speaker. For example, if you are using an AIR15s subwoofer with an AIR10 full-range speaker, enabling the AIR10 lowpass filter preset will correctly set the AIR15s lowpass filter for use with the AIR10. Set the subwoofer’s lowpass filter to its highest cutoff frequency. This will create an overlap between your subwoofers and your full-range system’s frequency response. Play program music with a lot of bass through your full system. Experiment with the polarity setting on your subwoofer to see which position provides the best bass response. Leave the polarity in the position that provided the loudest bass response. This means that your subwoofer is in phase with your full-range speaker. From this point, you can experiment with the lowpass and highpass filter settings until you find the one that provides the smoothest crossover transition. Again, your subwoofer should naturally extend the low-frequency response of your full-range system. You should not hear any frequency boosts or cuts. Once your crossover network is properly calibrated, listen to a wide variety of your favorite music and make any final adjustments. At the end of the day, your ears are the best tools you have. Find the spot in the room where coverage from the main speakers and the subwoofers overlap. 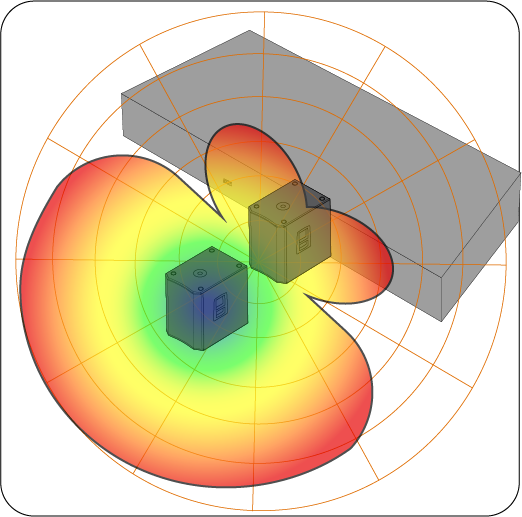 Measure the distance in feet from the overlap area to each speaker location. Subtract the smaller distance (the distance to the subwoofer) from the larger distance (the distance to the full-range loudspeaker). Multiply that number by 1.1 and apply that delay value to the subwoofer. Keep in mind that the overlap area may be behind front-of-house. Even for mobile applications, where the subwoofer is relatively close to the full-range loudspeakers, aligning the subwoofer to its full-range companion will yield tighter bass response. Both StudioLive AI-series and AIR-series subwoofers feature a variable alignment delay to guarantee that your three- and four-way systems stay in alignment. Sub-pole Mounted. When your full-range speaker is mounted directly atop your subwoofer, no delay is necessary. Full-range Onstage. When the full-range loudspeaker is on stage and the subwoofer is on the floor, the typical distance is around six feet. Delay your subwoofer by 6.6 ms. Most subwoofers are essentially omnidirectional. This means that they radiate sound around the entire cabinet, including on the stage. In addition to causing feedback onstage, subwoofer energy can make monitoring more difficult because it overwhelms the frequency content performers need to hear. When two subwoofers are arranged on each side of the stage, there can be a build-up of energy, resulting in a “power alley,” as energy from each subwoofer arrives at the same time and in phase with one another, summing together. Unfortunately, moving left or right of this center summation, one will find cancellation alleys. Creating a cardioid subwoofer array forms a more directional radiation pattern that keeps energy off of the stage and in the audience, where it is needed. 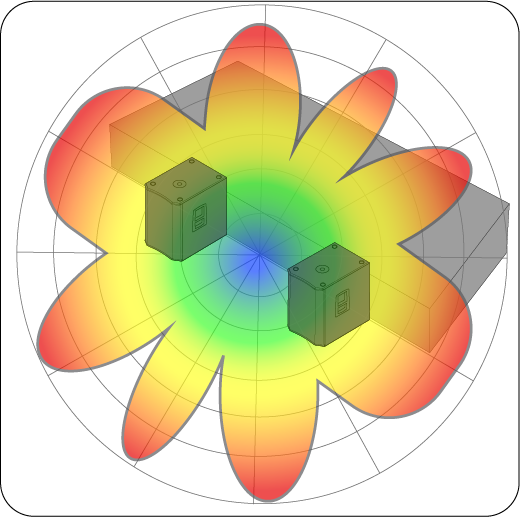 Ground-stacked Cardioid Array. For smaller spaces, creating a ground-stacked cardioid array is an easy way to focus the subwoofer onto the audience. 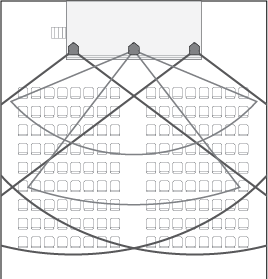 This type of array is created by stacking two subwoofers, one on top of the other, with the top subwoofer facing away from the audience and toward the stage. You will need to polarity-invert the cabinet that faces away from the audience and delay it by the depth of the subwoofer. The StudioLive 18sAI, AIR15s, and AIR18s subwoofers make this easy by providing presets to create a ground-stacked cardioid array. Once configured, your two subwoofers will radiate in a directional cardioid pattern, allowing you greater steering control over low-frequency energy. Endfire Cardioid Array. An end-fire array is created when subwoofers are placed in a row so that they are driving sound along the same axis. This focuses the sound in the direction the front speaker is facing. End-fire cardioid subwoofer arrays provide approximately 20 dB more cancellation behind the array than a ground-stacked array, so they will direct the most subwoofer energy away from stage. End-fire arrays can be very tricky to create, because each subwoofer requires its own delay but must use the same polarity as the other subwoofers in the array. Both the AIR15s and AIR18s make this quick and easy by providing a preset. The StudioLive 18sAI provides all the tools necessary to create an end-fire array with two or more subwoofers. If you delay your subwoofer array relative to your full-range systems, be sure to set the same relative delay time on every subwoofer in the array. This section describes some common system configurations. The size and shape of your room as well as your application will determine how many speakers you will need and where they should be placed. In any front-of-house situation, it’s important to ensure that the horn of your full-range loudspeaker is placed so that it is above the heads of your audience. In large venues, this will require suspending your loudspeakers from the ceiling or trussing. Please note: Suspending loudspeakers should only be done by a licensed and insured professional who can ensure that all safety precautions and building codes are followed. Stereo System. A stereo system allows panning and adds depth to the acoustic image. Because of this, it greatly enhances live or pre-recorded music. Locate speakers to give the best horizontal coverage. This will ensure that the listeners are well covered by the pattern. Mono Cluster with Down Fill. Center or mono systems can provide a simple, economical solution for venues where speech intelligibility is the priority, rather than music. As with a stereo system, make sure the coverage pattern of the speaker focuses the energy on the audience. 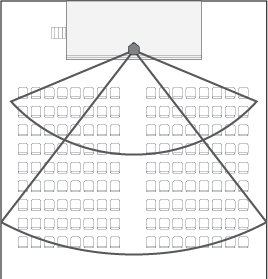 The graphic below, shows two speakers. 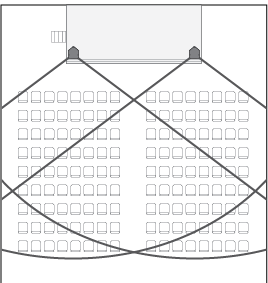 The upper speaker is throwing to the back of the room, and the lower speaker covers the space in the front of the room, closest to the stage. LCR Systems. An LCR system is a stereo system with a center speaker added. This configuration allows panning and adds depth to the acoustic image. This type of system will provide more control than a basic stereo system and is ideal in situations where music and speech intelligibility are equally important. Distributed Delay System. 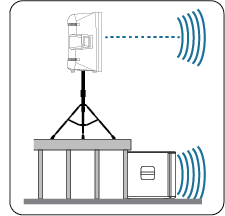 The goal in a complicated system with loudspeakers distributed throughout the venue is to delay each satellite system relative to its counterpart in the main system (e.g., the left front fill to the left FOH loudspeaker). Delay the main system relative to the source on stage. 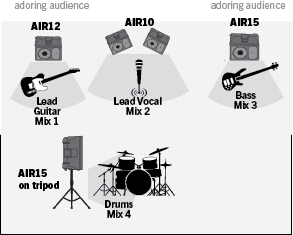 On small stages where the guitar amp and drum kit can be clearly heard above the FOH loudspeaker system, delaying the main system can “move up” the backline so that it aligns with these instruments and decreases blurring in the mix. This will tighten the overall mix and give it more punch. Delay the front fills relative to the main system by delaying each side of the system independently (e.g., delay the left front fill relative to the left FOH loudspeaker). Delay down-fill speakers (upper and under balcony) relative to the main system, again delaying each side of the system independently. Below are two examples of typical stage-monitor layouts. For musicians (such as a vocalist) who don’t require a lot of low-frequency energy in their floor wedge, we suggest using a 10” or 12” loudspeaker. On larger stages, stereo monitors will provide better clarity at a lower volume. For musicians that need a little more bass, a 15” loudspeaker may be preferable. 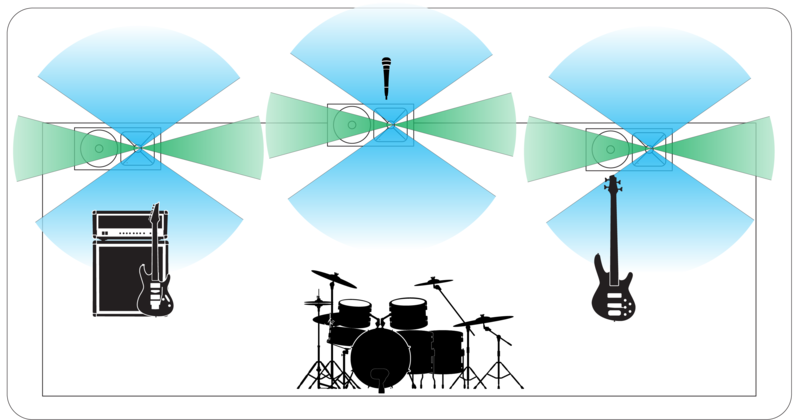 For the drum monitor on a large stage, it is useful to use a full-range, 3-way system (15” loudspeaker atop a subwoofer). For smaller stages, a 15” loudspeaker atop a low tripod or in the horizontal floor-wedge position will be more than adequate. 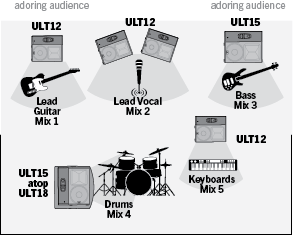 After you have positioned your loudspeakers, it is helpful to set all the levels in the P.A. system so that every component is optimized. While not essential, taking the time to properly calibrate your speakers will give you a great starting point to both troubleshoot and fine-tune your listening environment. Speaker calibration ensures that a specific metered signal level on your mixer equals a predetermined SPL at front-of-house. Depending upon the method and reference levels used during calibration, proper calibration can help reduce unwanted noise, minimize the risk of damage to loudspeakers and to your ears, and ensure you hear the audio as accurately as possible. There are many methods for calibrating a loudspeaker system. The important thing is not the way you calibrate your environment but that your environment has been calibrated—even if you only use your ears, common sense, and your favorite recording. You should calibrate the right and left loudspeakers independently to ensure that both are set to the same acoustic level. This will ensure that your speakers are balanced and that the audience will have the same listening experience wherever they are in the venue. Standard reference calibration is one of the most common calibration methods because it is the least subjective. The goal of this method is to ensure that when the output meters on the mixer register 0 dB, the SPL in the audience is a specified decibel level. This section will take you through the basics of standard-reference calibration. Calibrating speakers requires both an SPL meter and pink noise. Both signal noise generator and SPL meter apps are available for iOS® and Android™, many for free. Connect the main outputs of your mixer to your loudspeakers. Set the level on your loudspeakers to their lowest setting. Set the main mix level on your mixer to the lowest setting. Note: If you have any outboard processors (EQs, limiter, etc.) connected between the mixer and your loudspeakers, disconnect or bypass them. If your mixer has onboard processing, make sure that it is zeroed out or bypassed. Play 20 Hz to 20 kHz full-bandwidth pink noise at 0 dB through the main outputs of your mixer. Turn up the main mix to unity gain. Unity gain is the setting at which the signal level is neither boosted nor attenuated. It is usually marked by a “0” or a “U” on the mixer. You should not hear the pink noise. If you do, repeat step 2. Power down your left speaker. Slowly increase the volume of your right speaker until the acoustic level of the test tone playing reaches the same SPL as the level set on your left speaker. Stop the pink noise and turn your left speaker back on. Play some program music you are familiar with through your speakers and move throughout the room, making sure that your speakers sound balanced. If you are using a subwoofer, follow the same steps as above, but set the level on the subwoofer 6 dB less than the level you set on your full-range loudspeakers (that is, if you set the level on each loudspeaker to 95 dB, set the subwoofer level to 89 dB). Feedback is short term for a feedback loop, where a portion of the signal from the speaker returns to the microphone, resulting in a constant tone at the offending frequency. “Ringing out” is a process of attenuating the frequencies that are feeding back to maximize gain before feedback in your floor monitors. Note: Ringing out stage monitors will produce feedback. If you are not careful, you can produce a lot of feedback. Do not make sudden gain boosts; go slowly and carefully to avoid causing damage to speakers and ears. With the mic input gain at an appropriate level, bring the aux send level up on the mic channel you wish to ring. Do not “gain up” the mic signal on the monitor mixer for the sake of getting more volume out of a stage monitor. Gain staging is very important in order to have a feedback-free show. Slowly bring the aux output level up until you hear feedback. Using a real-time analyzer (RTA) or spectrograph will allow you to see which frequency is causing the problem and use an equalizer to remove the offender from your stage monitor. If you don’t have an RTA or spectrograph, you can create a narrow notch in a parametric EQ and sweep it across the band until the feedback is removed. Stage-monitor feedback typically occurs in the higher frequencies, which also is where intelligibility comes from, so only reduce the offending frequency to just below the point of feedback. If you do not have these tools at your disposal, bring back the level on the channel send to just before the point of feedback so you don’t take out too much signal content. Maximizing your intelligibility and gain structure results in clearer-sounding monitors. When you are ringing out a system, and more than two or three feedback loops are happening simultaneously, you have reached the level where stability can no longer be achieved. Try bringing down the overall output level or find a physical solution, such as moving the speaker or microphone.